The Curtiss H-75 was the export version of the American P-36 Hawk (Curtiss Model 75) fighter of the mid-1930s. The French took delivery of some 330 aircraft, designated the H-75A-1, A-2 and A-3, with the first planes entering service in the spring of 1939. They were modified for French Air Force usage and fitted with different equipment and armament. The H-75 was a single-seat, all-metal low-wing monoplane with fabric-covered control surfaces. It had a retractable undercarriage with the main landing gear rotated 90° to fold flat into the wing. Powered by a Pratt & Whitney R-1830 Twin Wasp two-row radial engine, it was fitted with Curtiss Electric propeller. The H-75's armament consisted of two machine guns in the nose, and another one (all H-75A-1s and 40 early H-75A-2s) or two guns in each wing (H-75A-3). A small bomb carrier was also mounted under each outer part of the wing. 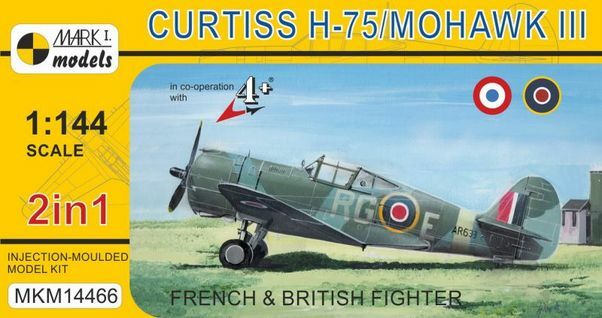 The Curtiss H-75 was used most extensively and successfully by the French Armée de l'Air during the Battle of France. The H-75s were also ordered by Norway, but did not arrive in time to see action before occupied by Nazi Germany. A number of ex-French aircraft were seized by Germans, some of them were used by the Luftwaffe for pilot training and eventually many sold to Finland, which extensively used them against Soviet forces. RAF also obtained various H-75s by way of diverted shipments to occupied France or from ex-Norwegian contracts; the H-75A-3 variant was designated the Mohawk Mk.III. Two injection-moulded kits are supplied in this box and each kit contains 29 parts and four clear parts (the cockpit canopy, rear windows and a landing light). A comprehensive decal sheet is included.